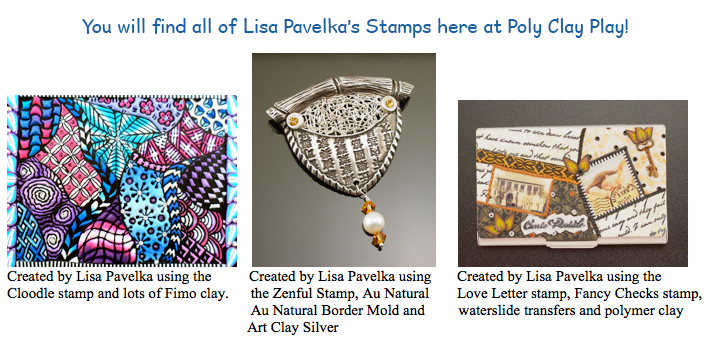 Lisa's stamps were created for use with various clays. They are made of vulcanized rubber which makes them very strong and durable. There are three sizes. Most measure approximately 5-1/2 x 4-1/4 inches, and are unmounted for optimal usability. The narrow stamps measure approximately 2" x 6-7/8" and the mini stamps approximately measure 3-1/2" x 4". The stamps work great with polymer clay, metal clay, paper, fabrics, wood, glass and more. These stamps are perfect for using with polymer clay applications like: Textile Effect, Mica Shift, Sutton Slice, Patterned Faux Dichroic and much more.